This week is all about…frozen treats! Thanks to Katie’s Cucina and Nutmeg Nanny for putting this fun week together. We can thank them later while we consume our cold treats in the 110F weather! In the meantime, let’s share some delicious treats! Nothing says summer more than a creamy, delicious ice pop – right? But today we decided to take it up a notch and create a twist on a classic dessert and the idea for a Chocolate Blueberry Crumble Pop was born! 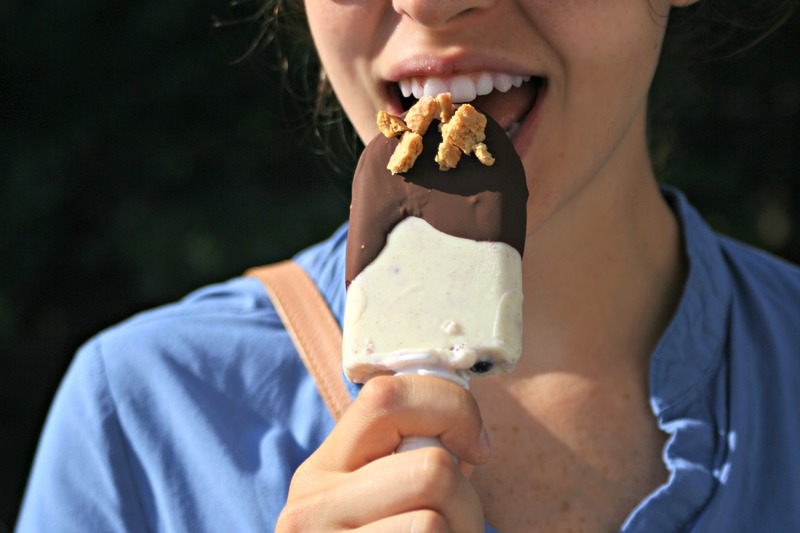 Lusciously creamy pops studded with tiny wild blueberries, dipped in dark chocolate and coated in graham cracker crumbles – it’s just what the summer ordered! This recipe is a basic one for creamy ice pops but can be modified to whatever you have available and is in season. Back to the Chocolate Blueberry Crumble Pops! We used both the Quick Pop Maker and the Zoku Chocolate Station, which makes it a breeze to have these treats ready to go in less than ten minutes! Plus, it makes for the perfect excuse for a middle of the afternoon heatwave party. 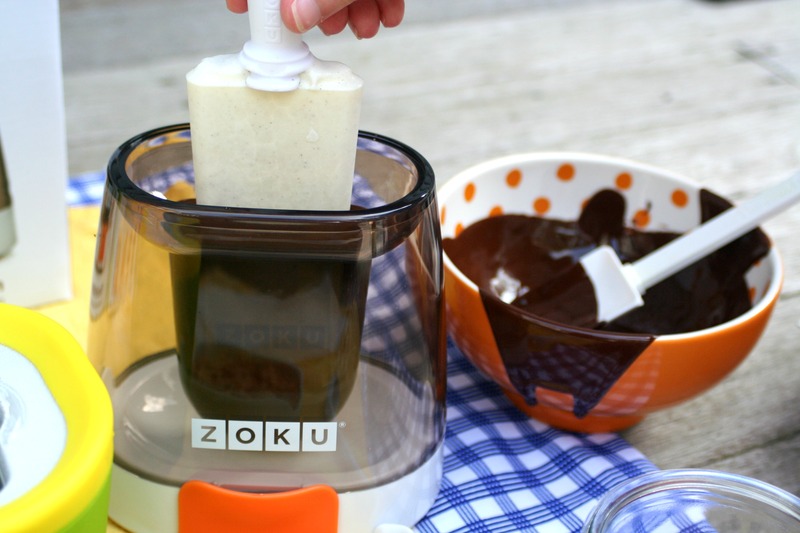 Just keep the Zoku Quick Pop Maker in the freezer and pop it out when you need to make ice pops. Also, the OXO Angled Measuring Cup is the perfect vessel to pour the blended pop mixture into the molds! You can make up to 9 pops before you have to refreeze the unit! And on the Chocolate Station is so handy: just pour melted chocolate (or a mix of melted chocolate and coconut oil for that magic shell effect) and dip your homemade pops into it. Dunk into toppings or sprinkle them over the top, everyone becomes an ice pop artist! This creamy, chocolate covered ice pop is sure to be a hit with friends and family! In a blender, blend milk, yogurt, vanilla bean paste, vanilla extract, and ground nutmeg. Pour blended mixture into your favorite ice pop molds and sprinkle with wild blueberries. Freeze completely. 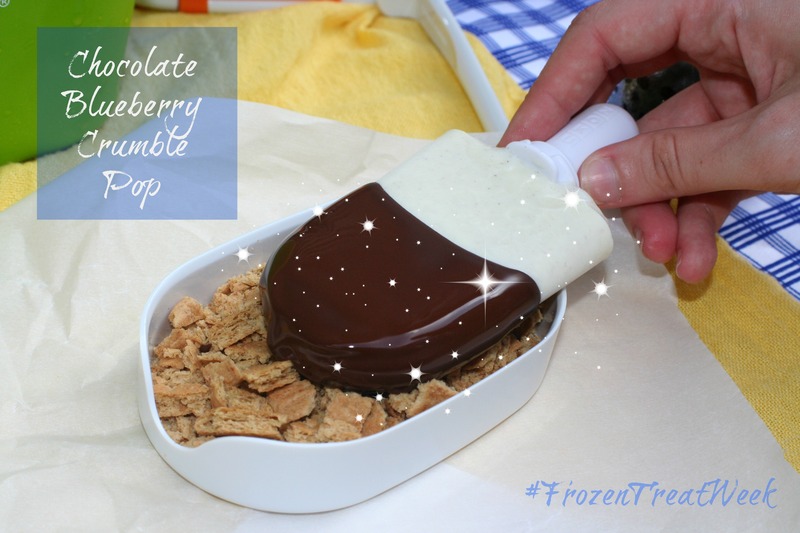 To serve: unmold the ice pops, dip in chocolate and coat in graham cracker crumbles. Enjoy! Above is my good friend Samantha Hirons modeling this delicious Chocolate Blueberry Crumble Pop, thanks Sam! 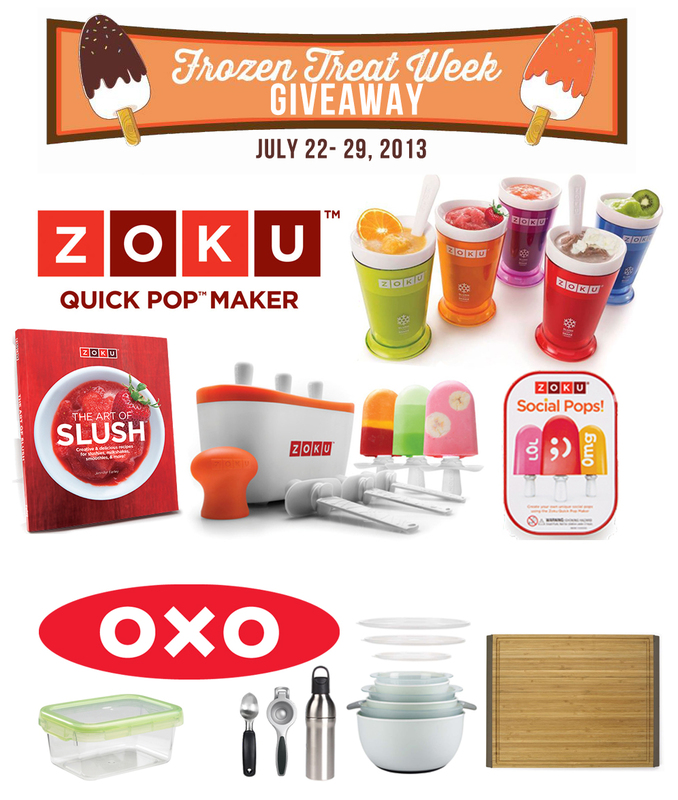 And we also wanted to give a huge thanks to the sponsors of today’s giveaway: Zoku and OXO. As you know, two of my favorite brands and I’m so happy to be working with them on this post. Thanks Zoku and OXO! and check out what delicious treats they made for you today! Disclaimer: Winner will be contacted via email. Email addresses will be used solely for the purpose of contacting the winner. Open to individuals over the age of 18 only with a United States mailing address. This giveaway is in no way sponsored, endorsed or administered by, or associated with Facebook in any way. No purchase necessary to enter. I was not compensated in any way for hosting this giveaway. What a great popsicle idea! I can’t believe how easy the chocolate station looks. I usually have to fill a giant cup up with chocolate, which wastes more chocolate than I’d like. This looks like the perfect fit for a popsicle! These look amazing! I want one of those Zoku machines now that I see how amazing they are. Plus that chocolate dipper is the dream accessory! Anything dipped in chocolate is A-OK with me! These pops are so much fun! Dipped in chocolate they look extra special! Yum! These pops sound so good and I need to get my hands on the chocolate dipping station. That thing looks awesome! I love fruity popsicles, but if we’re being totally honest, I love anything chocolate-coated WAY more! These look awesome! I’m so intrigued by this awesome maker. Since I love ice cream I would definitely be making some ice cream pops. Oh my goodness, Nelly. I could eat a whole batch of those by myself. 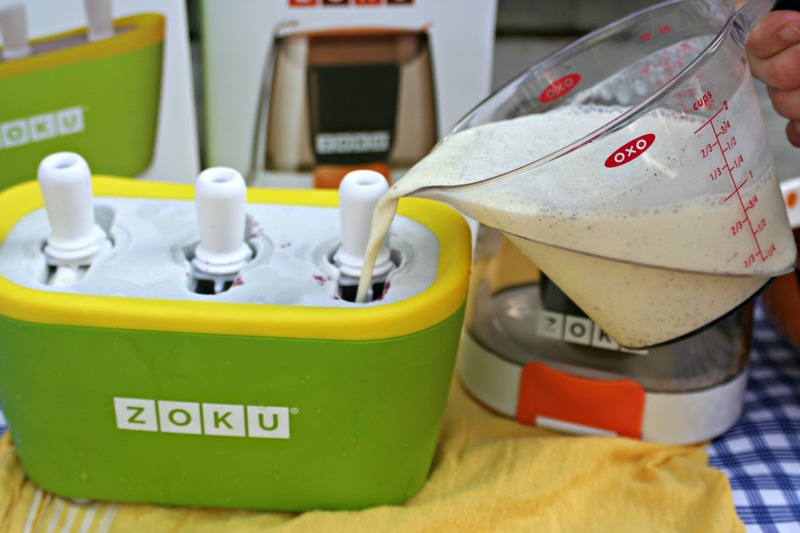 I want a Zoku pop maker so badly, but I’d have to buy 3 of them to make enough for my whole family at the same time!! Rebecca- the great thing is you can make 9 pops in a row until you have to refreeze it!!! So go for it!!! I want a pop maker so badly! It looks lovely! I really need to get me one of those pop makers- this is too easy to be true! And what a delicious flavor combo- I’m in love! So fun! Summer frozen treats are my fave. I’m currently obsessed with ice cream, but you have me tuning into the popsicle station. Love! Love how fast that makes the pops! My kids would be super thrilled if I had one of those makers.